It was always going to take a mammoth effort to wrench the rainbow jersey from Emma Pooleyâ€™s shoulders, and Judith Arndt of Germany produced exactly that. Sixteen years after her first world time-trial championships, a tearful Arndt was finally able to add gold to her three silvers and two bronze. Less triumph; more closure. Pooley put in a fabulous ride on the rain-soaked Copenhagen cobbles to claim a bronze medal, a deeply satisfying return on a flat course not expected to favour her. The hills of Geelong in Australia, where she triumphed last year, better suited her grafting style. But this result, if anything, was even more significant. â€œIâ€™m a bit sad that Iâ€™m not world champion any more, but I wasnâ€™t expecting to be,â€ she said. â€œDenmark is a bit flat for me. This time last year I would have been lucky to be in the top 10 on this type of course. So maybe it looks like a worse result, but actually Iâ€™m quite pleased.â€ Pooleyâ€™s success serves as a pleasing epilogue to a season that has often proved frustrating for her. In April she broke her collarbone in bizarre circumstances, hitting a post at low speed while riding on a public cycle path. But her performance here bodes well for next yearâ€™s Olympic Games, with the London time-trial set to be ridden over similarly gentle gradients. 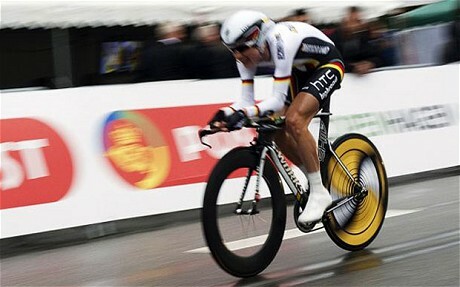 In the event, the wet weather rendered yesterdayâ€™s competition a far more technical test than anticipated. The sharp corners became a battle of wills, rider after rider aquaplaning through them as treacherously as they dared. Pooley was the last of the 51 riders to set out, but it became clear during the second of two nine-mile laps that Arndt was setting an unassailable pace. Clara Hughes of Canada, a former speed skater with medals in both summer and winter Olympics, had set the early benchmark. Fellow Canadian Tara Whitten took the lead late on, but moments later Linda Villumsen went quicker still to sit in gold medal position with only Arndt and Pooley capable of threatening her. Arndt had spent the first lap sizing up the turns, steeling herself for a furious assault on the home stretch. Legs whirring, veins bulging, pain etched over her face, she roared down the finishing straight, beating Villumsenâ€™s time by 22 seconds. As she staggered off her bike and dropped to her knees in celebration, Pooley was still grimly holding on, beating Whitten to bronze by just two seconds. The other British rider, Julia Shaw, came 17th. Villumsenâ€™s silver was an accomplishment of sorts for the home nation, with the 26 year-old having switched her allegiance from Denmark to New Zealand two years ago. But all eyes were on Arndt. Second in 2003, 2004 and 2010, third in 1997 and 2008, Arndt has a long and distinguished list of palmares. But this was the title she wanted. â€œI have been chasing this medal for many years,â€ she said. I canâ€™t tell you how much it means to me.â€ Today sees the menâ€™s time trial, and the prospect of a fascinating duel between Fabian Cancellara and Tony Martin. Cancellara of Switzerland is going for his fifth title in six years, but was surprisingly beaten by the German Martin in Salamanca last month. Britainâ€™s main chance lies with Bradley Wiggins, fresh from his podium place in the Vuelta two weeks ago, and David Millar, who won silver last year. Millar played down his own chances. â€œI think Bradleyâ€™s got a better chance than me,â€ he said. â€œI havenâ€™t had the racing I would like beforehand, so Iâ€™ll need to be realistic. Iâ€™d be very happy with top five.